Temperatures surged into the upper 50's last night as the warm/cold front responsible for yesterday's rain moved across the region. Another batch of rain will commence later this morning and this will continue in varying intensities before ending around 7 AM tomorrow. Another 1-2" are possible. The northeast radar shows some action working through Eastern NY/PA but the bulk is still in Western NY, WV and PA. Temperatures are running in the low 50's in Southern New England while they are in the upper 30's/low 40's in the Merrimack River Valley and other areas closer to the NH border. As a result of the warm air and moisture in the air we have fog and plenty of it this morning. This has prompted the NWS to issue a *Dense Fog Advisory* in gray and a *Special Weather Statement* in the Donald Trump skin color. 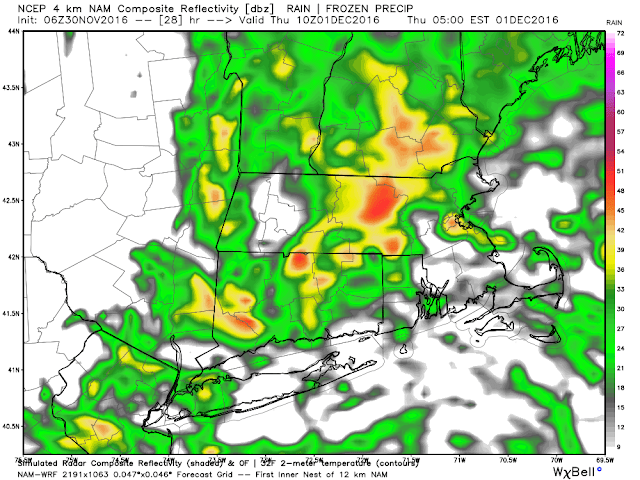 By noon the rain will be making its way into Western New England and pushing into Central New England. Max temperatures this afternoon are forecast to be right around 50. While it rains I expect temps to be in the upper 40's. 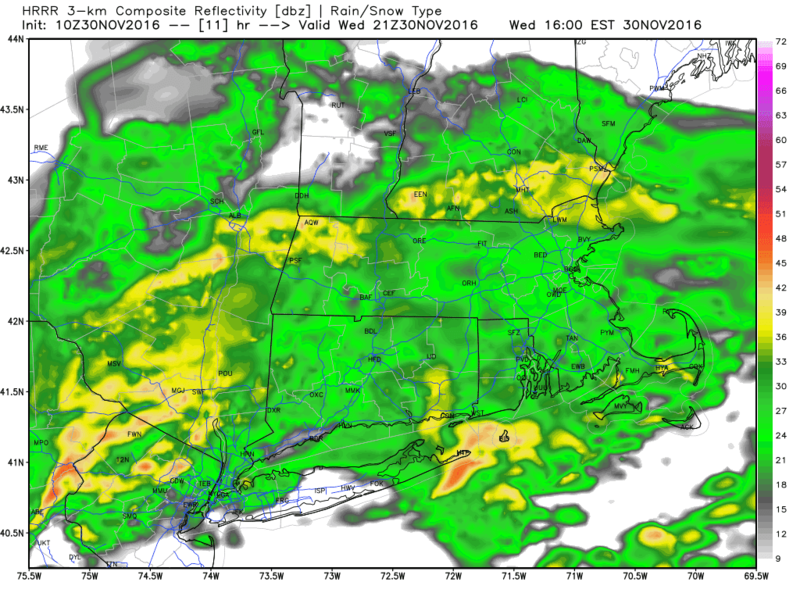 By 8 PM a warm front will lift through once more and the heaviest precipitation will fall as these fronts cross SNE even if coverage is not as great. A band of showers/thunder? overnight will finish off this storm. Here is the simulated radar for 5 AM tomorrow. Expect some gusty winds. This rain clears out during the Thursday AM commute. Another 1-2" will fall today/tonight which is continued good news as we try to recover from the drought. More on the weekend later tonight/tomorrow. The National Weather Service in Taunton has posted *Freezing Rain Advisories* for interior MA/VT/NH thanks to a warm front that will lift across the region today. Temperatures will quickly rise above freezing this AM and rise into the 50's/60's by this evening across Central and SE MA/RI. Total rainfall today 0.75-1.5". Here is the regional radar as of 530 AM. Light rain is beginning in Central/Western MA and it will work into Eastern MA shortly. There will be a bit of a lull between 7-930 AM before the main course arrives. As of 4 AM the surface warm front is still in PA/MD/VA. Looking at these temperatures and the current radar I would say NE MA dodged a bullet this morning with cold air firmly in place but not much precipitation. That said it only takes a small amount of ice to cause big problems so if travelling towards Lowell, Haverhill, S NH this morning please drive carefully. 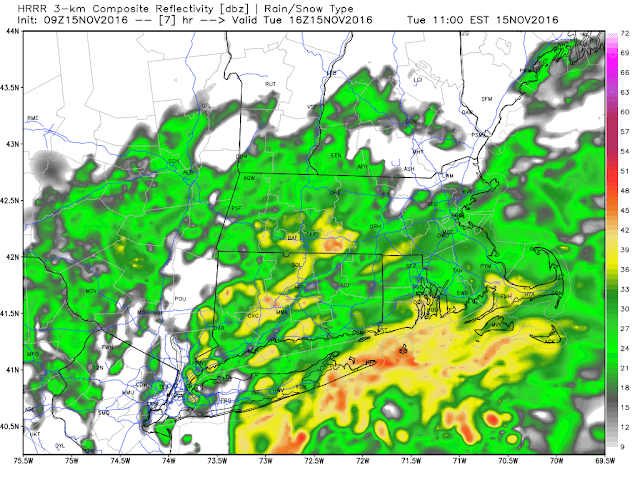 The steady rain is back by 10 AM and by 1 PM the entire region will see steady rain. Temperatures are jumping into the 40's and 50's by this time so expect all precipitation to be rain. Note the cold air holding on in Central/Northern New England. That is in sharp contrast to 60's at the CT/RI shore. A surface low along the warm front will clear the region around 7 PM tonight. 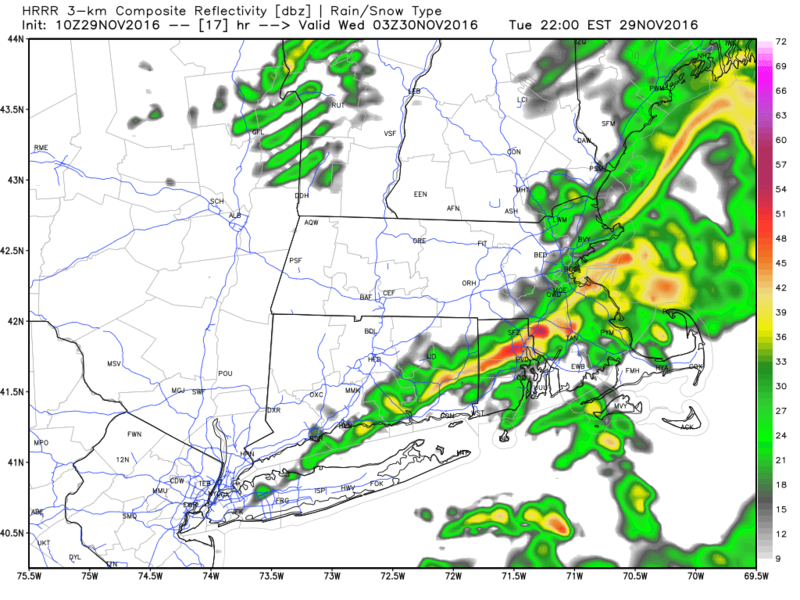 The warm front will likely settle near the MA Pike towards Rt 2. The rain will exit from west to east beginning 7-10 PM this evening. 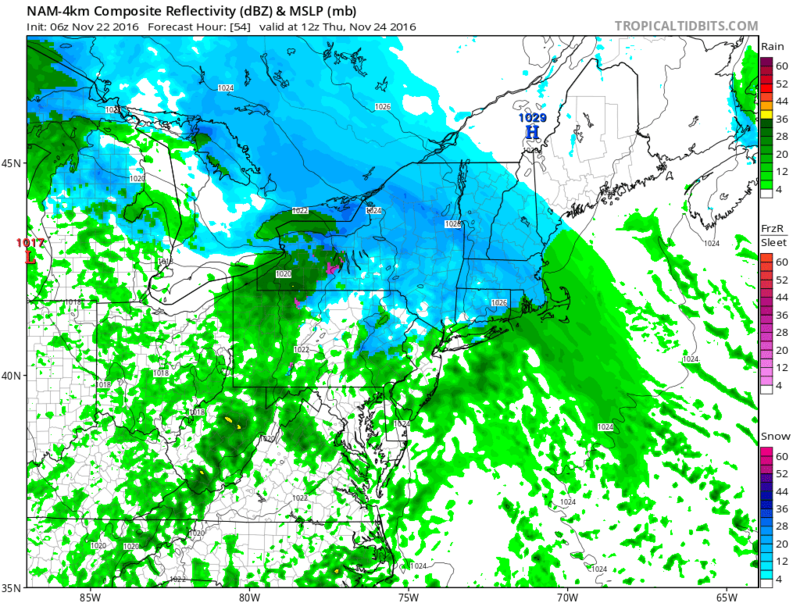 A band of heavy precipitation may end the event in RI and SE MA. 0.75 to 1.5" is my forecast but high resolution computer guidance suggests some amounts greater than 2" are possible although this seems like a low probability. I'll update tomorrow's forecast later on this afternoon/evening as more rain is in the forecast. The weekend looks seasonable with temperatures in the 40's and mostly sunny skies. Dry late fall weather is in place this afternoon through Monday evening as high pressure is in control. A active jet stream will bring two rounds of rain Tuesday afternoon and again Wednesday afternoon into Thursday morning. Southern New England will be on the warm side of this storm that is loaded with moisture. Total precipitation from both events will exceed 2-3" in some spots. 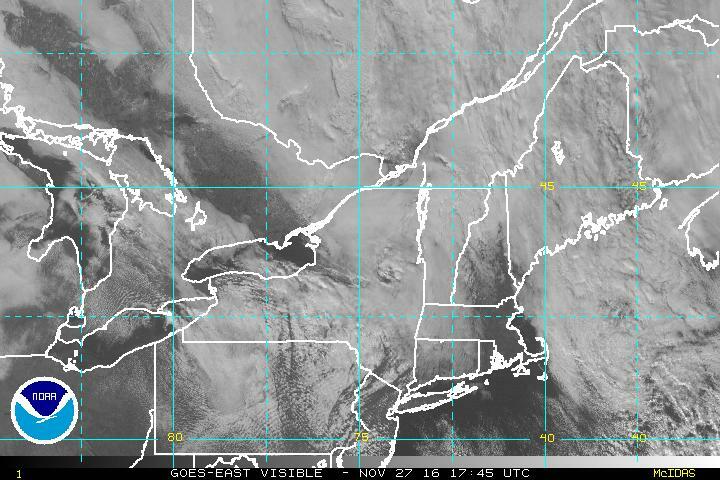 Much of Southeastern New England is cloud free but clouds are filling in from NW to SE across Worcester County. High pressure is in control for the entire Eastern US. The next weather maker is still out in Colorado. The clouds will dissipate tonight and the winds will relax allowing for cold Canadian air to mix in. 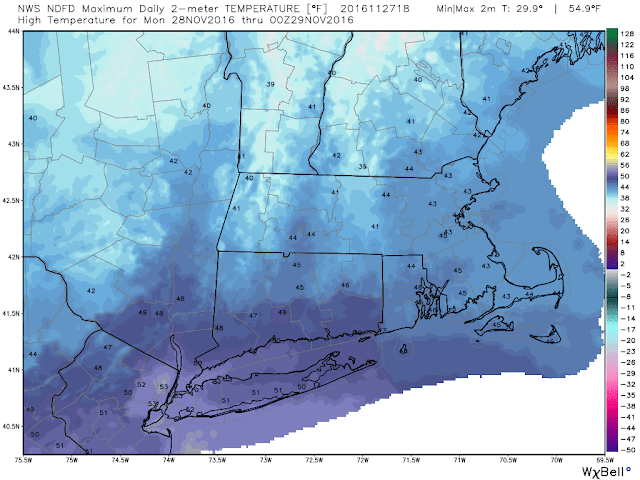 Lows will be in the mid 20's inland to near 32 in the cities. Pleasant weather is on tap for Monday. High pressure remains in control. Our next weather maker has now moved towards the Upper Midwest/Great Lakes. Temperatures tomorrow are 3-5 degrees below average with max temps in the low 40's. Winds will be out of the west at 3-7 MPH. 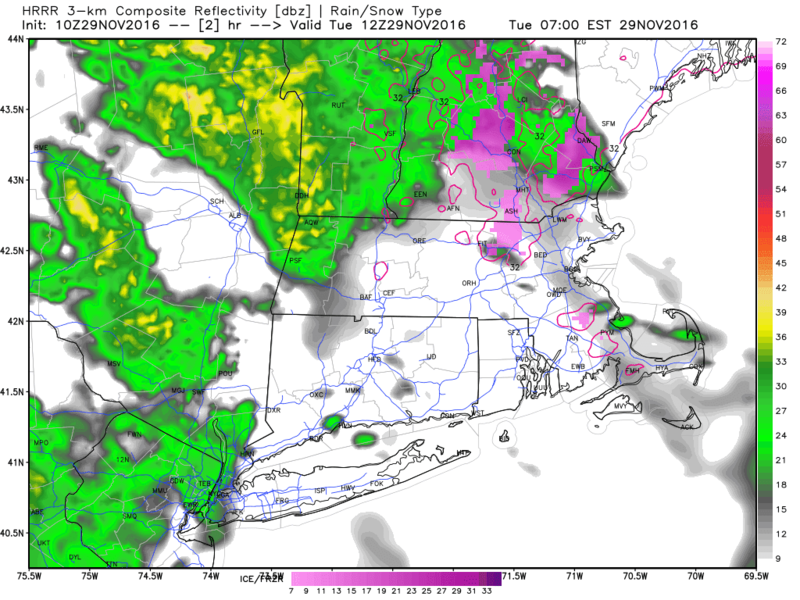 A warm front will lift through the region on Tuesday bringing the first batch of precipitation with it. The warm air will likely be delayed into the region until Tuesday night into Wednesday. Precipitation is expected to start around 9-11 AM although I'll have to watch that start time as some guidance moves the precipitation into the region earlier. 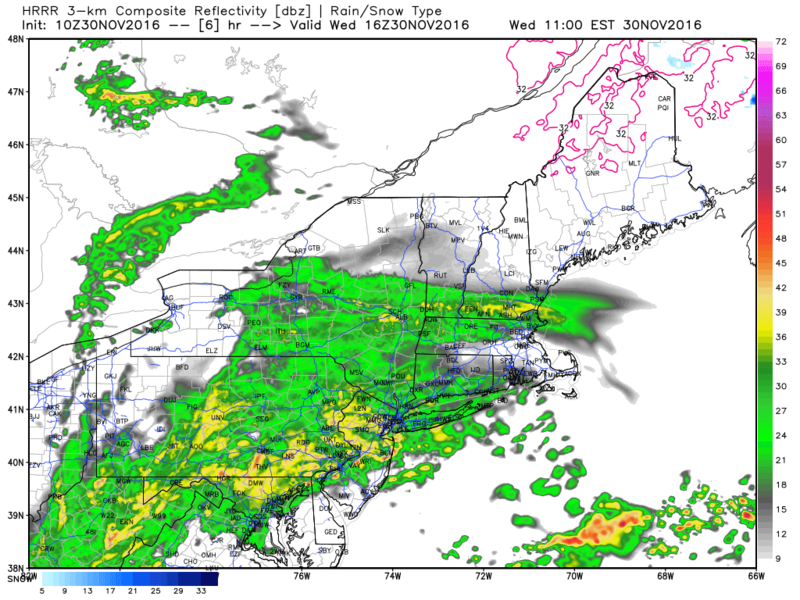 Here is the simulated radar for Tuesday 1 PM. It will feel raw on Tuesday with max temps in the mid to upper 40's. This batch of rain will exit Tuesday night. 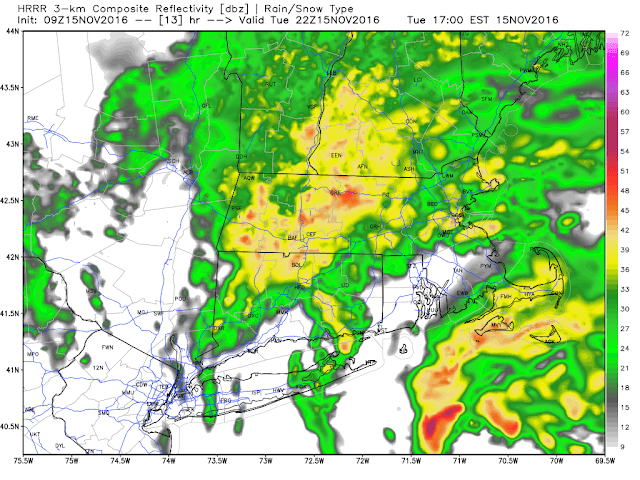 Wednesday AM actually looks pretty good before a coastal low forms and brings more precipitation to SNE Wednesday PM into Thursday AM. Skies begin to clear Thursday before noon time. Max temps will be near 50. More on the rain as we get closer to the event. Cold blustery weather continues Tuesday although winds will be less then the past two days. Temperatures moderate slightly on Wednesday before a disturbance moves through Wed PM into Thursday AM. Some of the precipitation may fall in the form of snow, sleet, and freezing drizzle. As a result travel Thursday AM will be slow. Current temperatures are near AM minimums. Many communities are in the mid to upper 20's with mostly clear skies and light winds. There may be one or two snow showers around this AM before skies become mostly sunny. We still have high pressure to our west and low pressure in the Canadian Maritimes. The clockwise flow around the high and counter clockwise flow around the low are keeping this cold air mass in place. Max temperatures are in the 40's across Eastern MA/RI/and the CT River Valley while temperatures remain in the upper 30's across parts of Worcester County. Temperatures tonight again drop into the 20's region wide. By Wednesday AM high pressure will kick east a bit lessening some of the cold air (but not much). 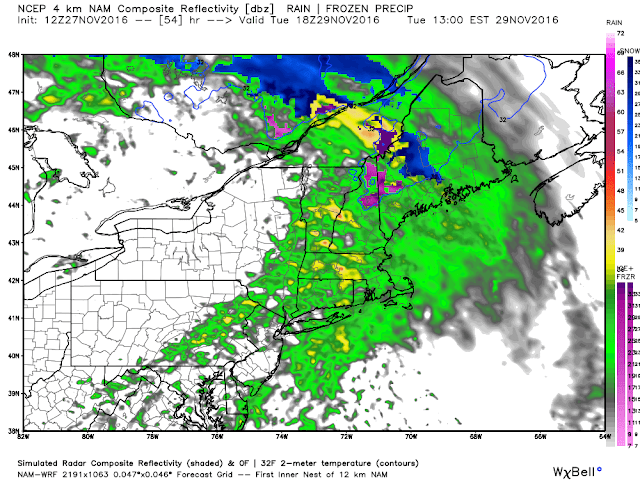 Here is the surface fronts/precipitation at 7 AM tomorrow. If one is traveling for the holiday the trouble areas are across the Central US and Western US. While that fronts looks like it will mean business for the east coast we anticipate weakening. Max temperatures tomorrow are similar to today. Now check out the approaching precipitation tomorrow evening. 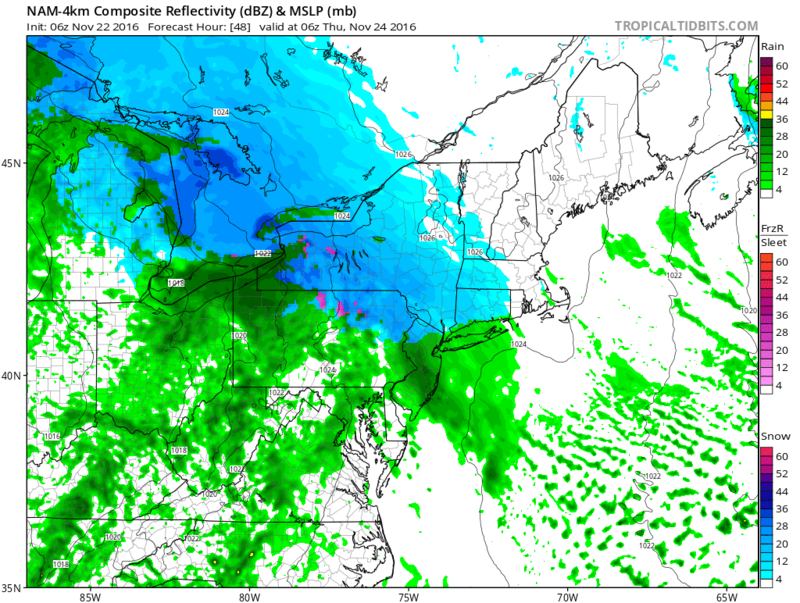 A mix of snow/sleet/freezing rain is in Upstate New York moving toward New England. That precipitation should hold off in Central MA/RI/E MA until after midnight. Here is the zoomed in radar at 1 AM Thursday. This particular model favors snow at this hour and not a mix. This is also very light. If rooting for a scenario the snow would cause the least amounts of disruption. Temperatures Thursday AM will be in the mid to upper 20's. That is why at 7 AM it will likely be snowing/sleeting across much of Southern New England. Other computer models are slower with the precipitation and weaker which results in some light rain showers. I favor the colder solution but I will evaluate later today/tomorrow. If it is the warmer/weaker event then travel is much easier. How much snow? Very little on roads but it will collect on grassy/dirt surfaces. 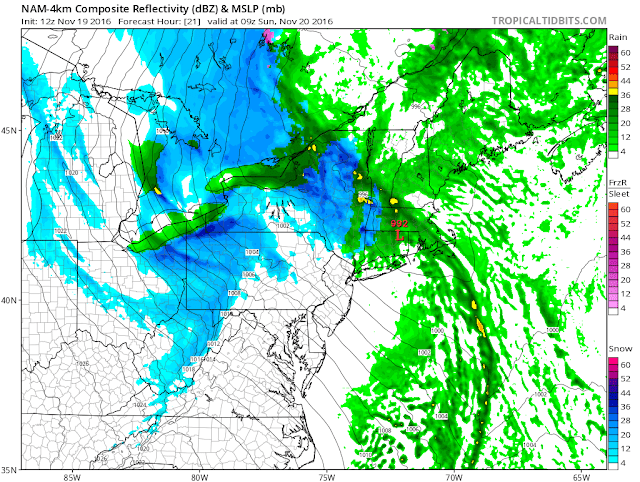 A vigorous low pressure system is delivering the first widespread snowfall of the season to the Midwest and Great Lakes, As the system moves east it will bring snow to the interior Northeast including the mountains of Western New England. 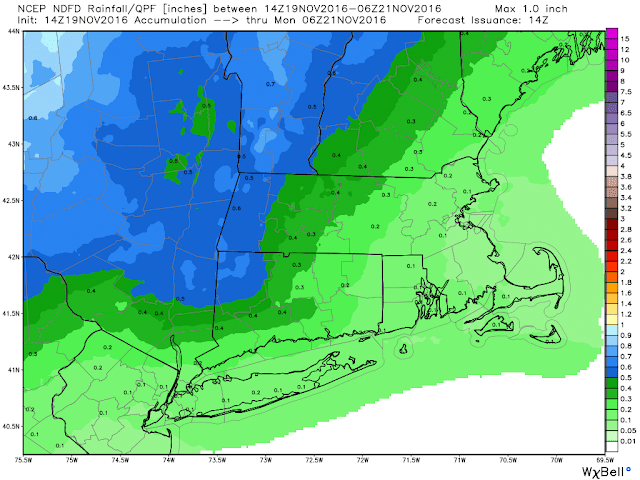 In the urban corridor of Southern New England we will see mostly rain but it will end as some light snow showers Sunday evening. Little to no accumulation is expected. The IR satellite shows the storm in the Great Lakes. There is also another storm moving into the NW US and low pressure offshore of New England. The low in the Atlantic is responsible for gray skies in Southeastern New England as it slowly spins offshore. The system in the Great Lakes will push this out to sea as it moves towards the coast this weekend. Here is the surface chart as of 7 am. Temperatures are crashing behind this front. 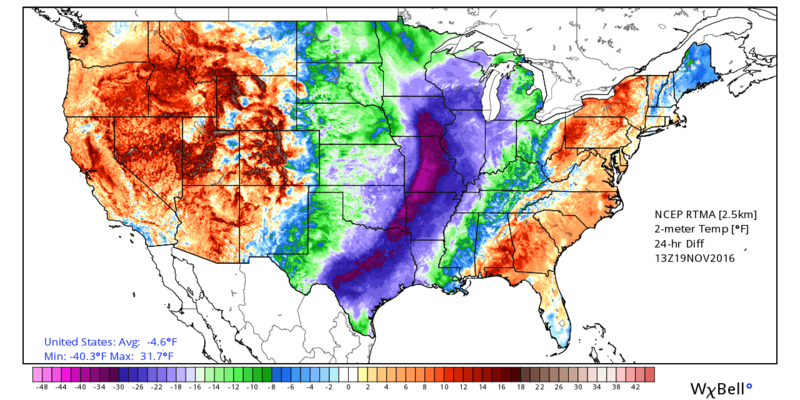 Here the 24 hour temperature difference for the US. Temperatures are running over -30 F cooler at this time today when compared to yesterday in the Central US. A significant lake effect snow event will take place in Western NY/PA. Cold Canadian air blowing over the relatively warm Great Lakes is a favorable set up for heavy snow in this part of the country. In this radar image of the Great Lakes the leading band is heavy rain which lines up well with the surface cold front. The precipitation in Michigan is lake effect snow. A secondary surface low will form near the Southern New England coast this evening. Maximum temperatures today are in the 50's. It will be cooler in Eastern MA thanks to the cloud cover and warmer in Western MA thanks to more sunshine. A mix of sun and clouds is forecast in Central MA. Everyone in SNE is way too warm for snow at the beginning. We should see some pockets of light showers and drizzle this evening. Steady rain works into CT/W MA after 10-11 PM and through Central/Eastern MA/RI around 1-2 AM. Here is the surface map at this time. Here is the simulated radar for 4 AM. The low is rather weak so I don't expect a ton of rain tonight. 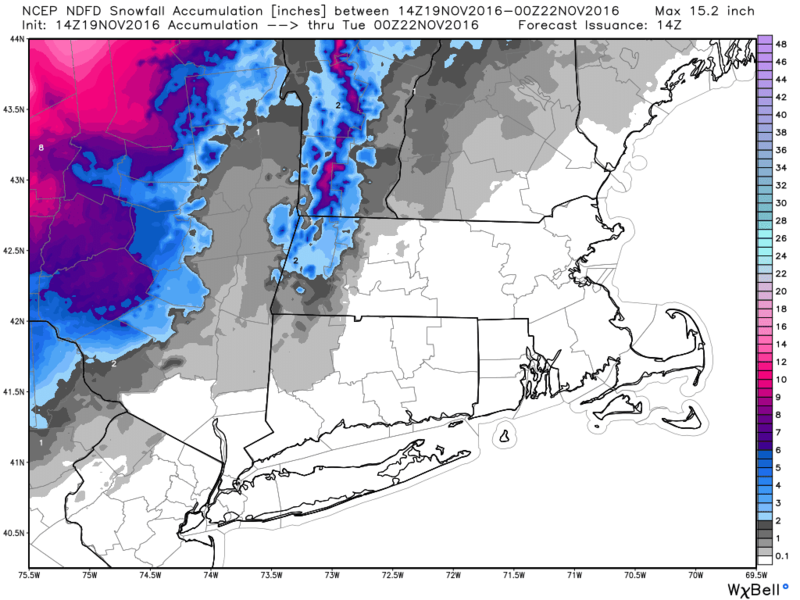 The low will gain strength as it moves into Northern New England which will contribute to heavy snow in the Green Mountains. As the low deepens winds will increase across SNE blowing upwards of 40 MPH. We don't expect Sunday to be a washout but it will be cold with a stiff N/NW wind and off/on showers. By around 5-6 PM Central MA/N RI/CT can start to see snow showers. First here is expected precipitation through Monday 1 AM. Here is the simulated radar for Sunday 7 PM. 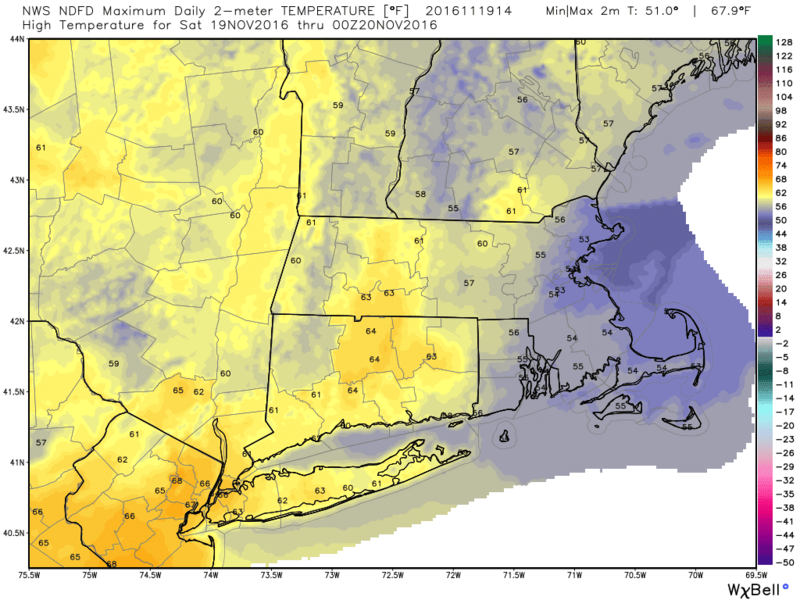 Max temperatures tomorrow occur early before dropping in the afternoon. Expecting around 40 for most. We drop into the mid 20's Sunday night. So as you can see my teacher friends you have to make your lunch and grade your papers tomorrow. A developing area of low pressure will track over or near Southern New England today bringing heavy rain to the region. Thanks in part to the "King Tide" and "Supermoon" the tides are the highest of the year already. The low will add a few feet to the tide resulting in minor coastal flooding along the coast. 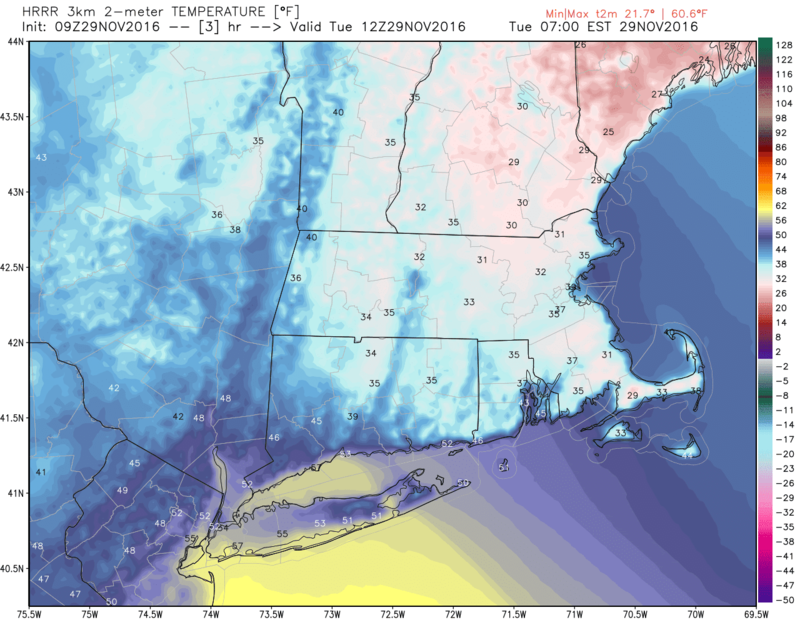 Temperatures will struggle to get out of the 40's inland except for late this afternoon as the low moves over SE New England. As that happens temps will briefly spike into the upper 50's/low 60's. Here is the surface analysis as of 4 AM. Our storm is just getting its act together off the Mid-Atlantic coast. Steady rain will begin to work into CT/RI by 8-9 AM. The first heavy band of rain that may have some thunder/lightning will move into MA between 10-11 AM. Some locations within these bands may see upwards of 1"/hr rainfall rates which will result in localized street flooding. Look at all that moisture lurking offshore! It will be a wet afternoon/evening for the region. 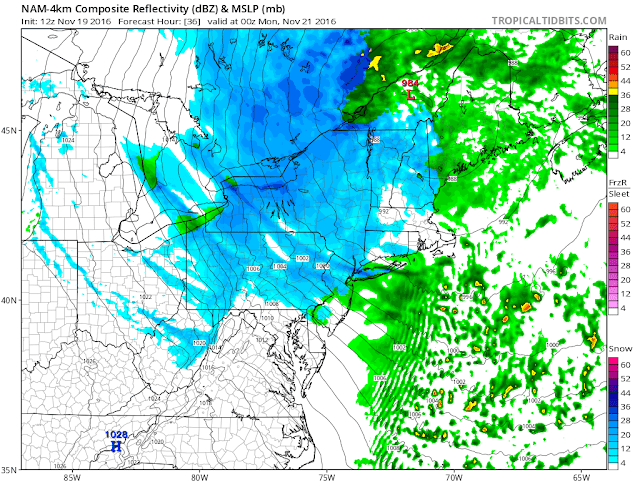 The low is forecast to gain some strength as it crosses over SE RI/SE MA. Here is the 1 PM surface fronts/precipitation. The NWS has issued several coastal flood watches/advisories/statements for our beaches. You can find them here. Moving forward to the evening commute we may see a lull in SE MA/RI before the center moves through. That said 1" of rain may have already fallen which will make roads slick. It will still be raining north of the MA Pike and east of 495 around this time. Check out this radar for 9 PM. 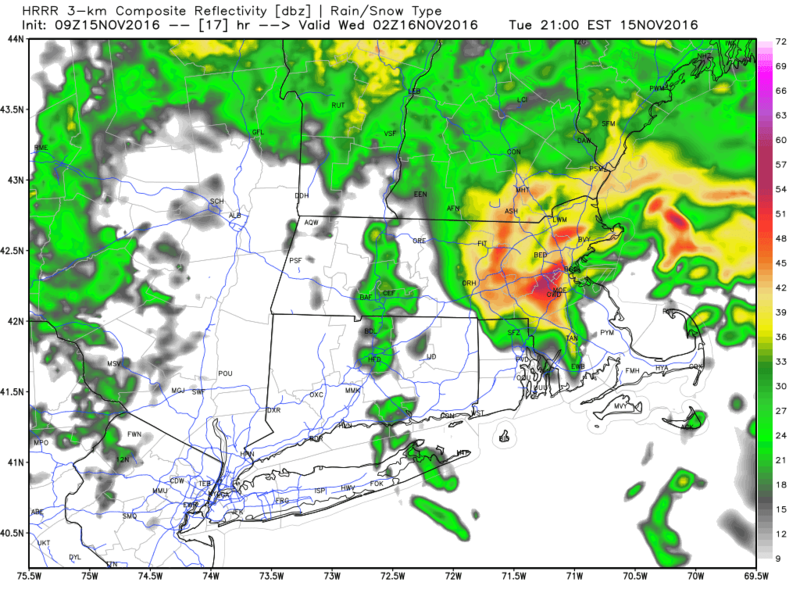 It will be difficult to drive this evening in Eastern MA if this verifies. There is no cold air behind this storm so temperatures will be pleasant through Saturday. Have a great day, thanks for reading.